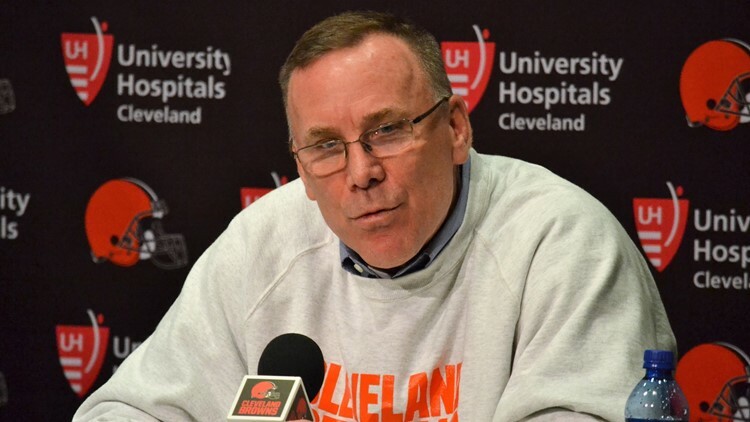 General manager John Dorsey promises a thoughtful, deliberate and thorough process in the search for the next full-time coach of the Cleveland Browns. BEREA, Ohio — As his track record shows, Cleveland Browns general manager John Dorsey is willing to give players with checkered pasts second chances to play professional football, and he did so again Monday by signing former Kansas City Chiefs running back Kareem Hunt. A Pro Bowl player in 2017, Hunt was caught on video pushing a man into a woman, and later, walking back over to the woman and kicking her to the ground. Also, Hunt was seen having to be physically restrained from continuing the argument. When the video was released last November, Hunt immediately was released by the Chiefs, but after doing “extensive research,” Dorsey felt comfortable enough with the information gathered to give the Willoughby native and South High School graduate a second chance. A product of the University of Toledo, Hunt was released from his rookie contract on November 30, 2018 when video surfaced of him pushing down, and later, kicking a woman at The 9 Hotel in Downtown Cleveland. Since that video became public, reports of other physical incidents involving Hunt have surfaced. “At the end of it, one thing we did find was he understands and takes full accountability for the act, for the egregious act he committed,” Dorsey said. “He is extremely remorse for his actions. What he has done is he has sought professional counselling. “At the end of the day, you have to earn those stripes,” Dorsey said. “You have to earn that, and you earn that by making the final 53 roster. There are no guarantees of anything.